Washington Heights, NYC - PW Coogan, owner of the best track bar in the Northeast - Coogan's (www.coogans.com), recently reviewed the running book, "Juggernauts." Here's his review in entirety pulled from Coogan's Corner on www.armorytrack.com. Another must read for runners. In the ol’ movies there was a collection of riff-raff called the East Side Kids. The movie plots were about bullies, the powerful gangsters and cops being outwitted and downsized by these street wise, mother loving kids. Well, here’s the country version - the Juggernauts! They didn’t need much inspiration to train, and they trained laughing, and when their idol Steve Prefontaine died, they trained crying but they trained. They ran for the love of it, they ran for the fun of it and they won because they were brave enough not to let each other down. Before I could say, ‘what the heck is a Juggernaut?’ I found myself immersed in this wonderfully paced story, which is difficult to put down. Steve Adkisson puts you on his shoulders, and takes you on his four year high school running journey. I felt like a mini-cam attached to his head and was only sorry when the book ended, but in my imagination the camera still remains on. Adkisson is a writing pro and his technique is as focused as his team’s determination. 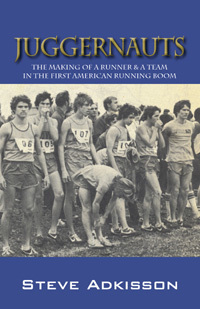 We enter the small town world of Kentucky in the nineteen seventies, and follow a group of kids who teach us the chemistry of wonderment and the ingredients of championship running. When the announcement is made for cross country try-outs, the diminutive country boy Adkisson ask his friend “what’s that?” The reply is, “it’s the fall sport all the basketball players do, to get in shape for the season” that is, until the arrival of Vietnam vet, and recent college grad, Mike Daley. Daley tells his motley collection of bell bottomed, army jacket wearing, some with cigarettes dangling from the lip, runners (well, this is tobacco country in the seventies) to “show up on time and get along”. As the reader finds out, the coach is a minimalist, that is, with the exception of assigning workouts. When the Juggernauts are turned loose they run, too far, too fast and too hard, and end up rolling in pain, sweat and vomit. Rather than crying these kids think it’s funny, and it becomes their running style and philosophy. They win because they enjoy the pain that defeats their competitors. To his adversaries, the 5’2”, less than a hundred pounds Adkisson, is the proverbial gnat that buzzes in your ear until you slap yourself silly as it flies away to the finish line, leaving you behind! The Juggernauts practice sessions involve jumping in as many of their rich neighbors pools as possible, without getting shot. They talk the bigger and heavier boys of the football team into coming along and streaking Main Street, realizing that if anyone will be caught it will not be the fleet footed Juggernauts. I guess we know that running is the more cerebral sport. But these young men are serious in their madness. They deliver newspapers, work on farms, run two a day practices, go to school and pride themselves in being able to buy real new running shoes. You will remember the boys from Lloyd Memorial High School for a long time. The Baynum brothers, Jeff, JC, Mark, Dave and Jude, who runs in his lucky red hat, and though competing coaches think it should be removed during a race… well, we’re in Kentucky and the hat remains on just like this story. The Juggernauts are too short, too gangly and, unlike this book, without talent or technique. But they sure knew how to fire it up and let it go! So runners, coaches and parents, you want this book for the team library, but don’t lend it out if you want to get it back, this book has legs!